Using T5 lamps is a cost-effective lighting systems solution for a variety of reasons. Unfortunately the average T5 lamp will dissipate about 73% of its total lamp power as heat. And when this lamp is used in combination with a tube guard, that heat must be properly dissipated from the lamp. Engineered Product Company's (EPCO) T5 HD (Heat Dissipation) Series Tube Guards takes into consideration two major factors; the temperature on the inside of the tube guard, and how close the T5 lamp is actually located to the tube guard. 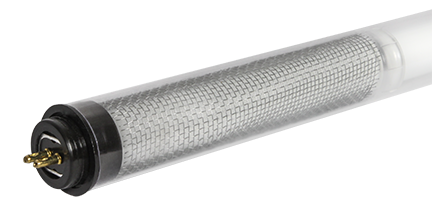 EPCO always recommends using "Heat Sink" when installing T5 HD Series Tube Guards to help distribute excessive heat on both ends of the fluorescent lamp. NOTE: EPCO will not break case carton quantities! T5 HD Series - Clear, is available in carton quantities of 48 and 120 Units. T5 HD Series Tube Guards are rated for use with a T5 HO Lamp. Tube Guards, other than sizes and colors listed, can be special ordered. Contact the EPCO Inside Sales Department for more information. WARNING: It is safe to use EPCO Tube Guards preferably in conjunction with electronic high efficiency ballasts that are designed to prevent over-heating of the lamp during use and at the lamp's "end of life". EPCO does not recommend using its Tube Guards under any conditions where the surface temperature of the lamp can exceed 225°F (107°C) or in any enclosed light fixture where normal venting is prohibited. We recommend using Heat Sink Screens with all Tube Guards. (Heat Sink: T5 HD Series - P/N 17893) Note: EPCO Tube Guards should not be used where power surges or voltage spikes can cause arcing or over-burning the lamps. *The temperature is measured on the inside surface of the Tube Guard. The ambient testing temperature was 72°F using a T5 F54 HO Lamp. **The combination of the T5 HD Series Tube Guard, "vented" End Caps, and Heat Sink lower the inside temperature of the tube guard approximately 30°F (-1°C). Both images show T5 HD Series Tube Guard with Built-in Heat Sink and "Vented" End Caps.